If you would like to see a complete list of all the changes, please visit the VoiceBot Change Log. Resolved an issue that broke macros that use "System.Web.HttpUtility.HtmlDecode"
We're also very excited to introduce our newest product, VoiceBot! 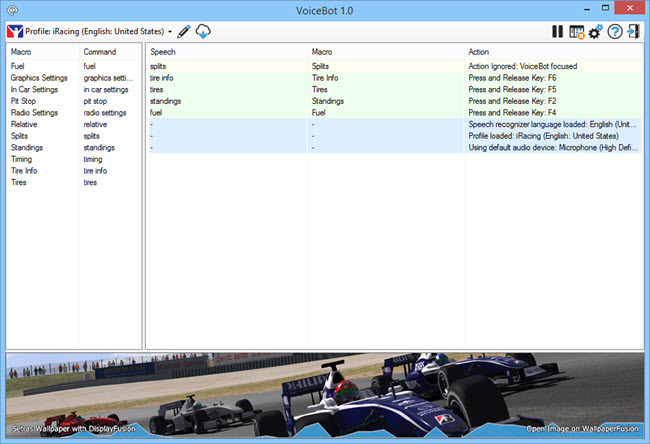 VoiceBot allows you to control games and applications with your voice. Simply speak a command and VoiceBot will send the keystrokes, mouse-clicks, or anything else necessary to perform the desired action. VoiceBot can also perform actions like text-to-speech, running highly flexible scripts, starting programs, and much more! With over 100 pre-made game and application profiles available, it's easy to started. Give it a try for free today! Window Location is a powerful feature that allows you to set the default location of an application's first window only, or the first window as well as subsequent child windows. You can have the application automatically move to a specific monitor and have it centred, maximized, or minimized. If you want to get even fancier, you can have the Window Location rule run any function from the list of functions on the Settings > Functions tab. You can even create a custom function to set the exact location and size in pixels, or you can create a scripted function to do almost anything you like with the window. 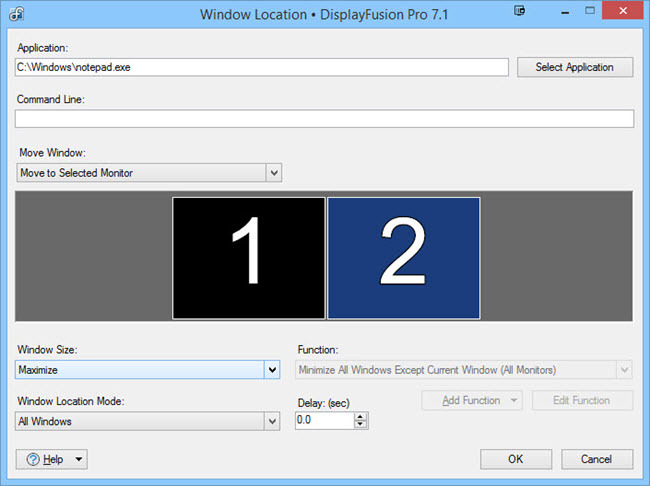 Open the DisplayFusion Settings > Window Location tab. Make sure the "Enable Window Location" option is enabled. Click "Select Application." If your application is currently running, it will be listed in the Select Application window. If it's not running, click Browse and locate the program's .exe on the drive. In the "Move Window" drop-down, choose whether you want the application to start on the current monitor (the monitor that the mouse cursor is on), or move to a specific monitor. If you choose "Move to Selected Monitor," click the monitor in the box below the "Move Window" drop-down. In the "Window Size" drop-down, choose whether you want the application to be Maximized, Minimized, Centred, or Spanned after it's moved. In the "Window Location Mode" drop-down, choose whether this rule should apply only to the first window of the application, or all windows. "All windows" includes dialogs and message boxes in addition to regular child windows. In the "Move Window" drop-down, choose "Keep on Same Monitor." In the "Window Size" drop-down, choose "Run Selected Function on Window." In the "Function" drop-down, choose the Function that you'd like to have DisplayFusion run on the application when it opens. 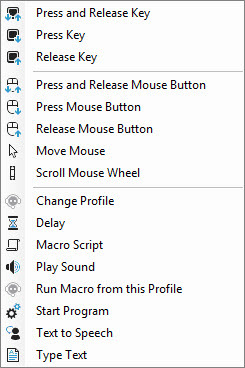 In the "Move Window" drop-down, choose "Move to Current Monitor." In the "Window Size" drop-down, choose one of the sizing options. In the "Window Location Mode" drop-down, choose "All Windows." 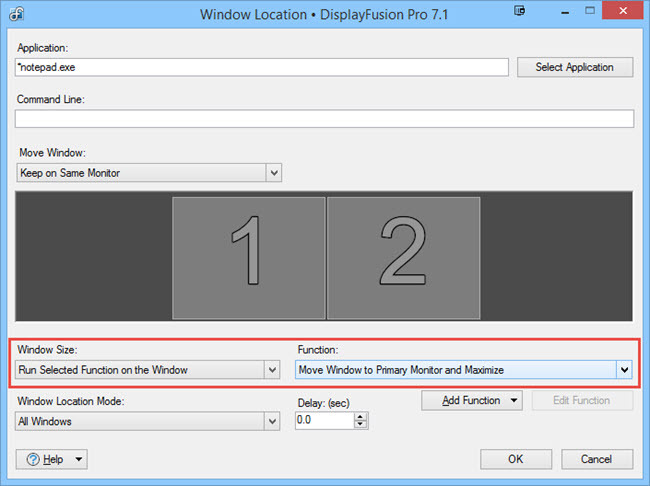 Open the DisplayFusion Settings > Functions tab. Click the "Download Scripted" button. Download the "Move Only a Specific Window of an Application" script. 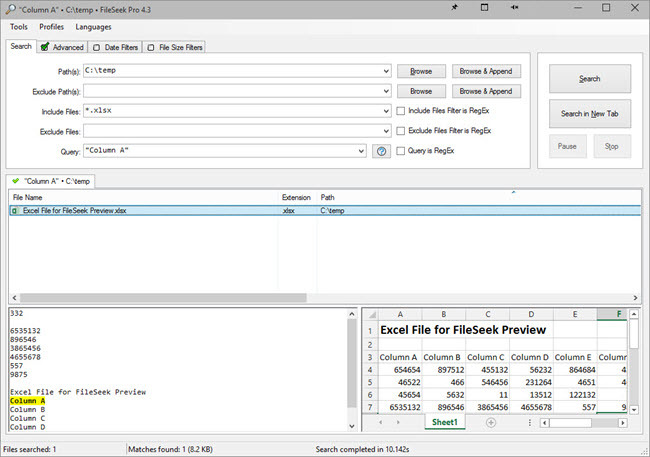 Edit the script to look for the window title of the window you want it to apply to, and also change the X and Y values for the location. You can also modify the code in the "if" statement to do other things with the window if you like. In the "Function" drop-down, choose the "Move Only a Specific Window of an Application" Function. We're very excited to introduce VoiceBot! 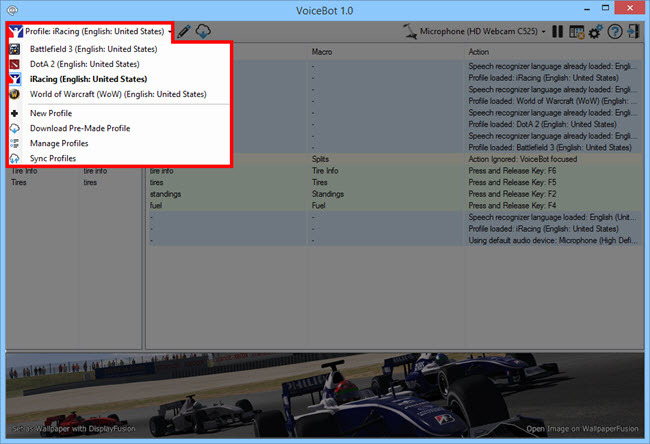 VoiceBot is a new product that allows you to control games and other applications with your voice. Simply speak a command and VoiceBot will send the keystrokes, mouse-clicks, or anything else necessary to perform the desired action. VoiceBot can also perform actions like text-to-speech, running highly flexible scripts, starting programs, and much more! With well over 100 pre-made game and application profiles available for download, it's easy to get up and running with just a few clicks. 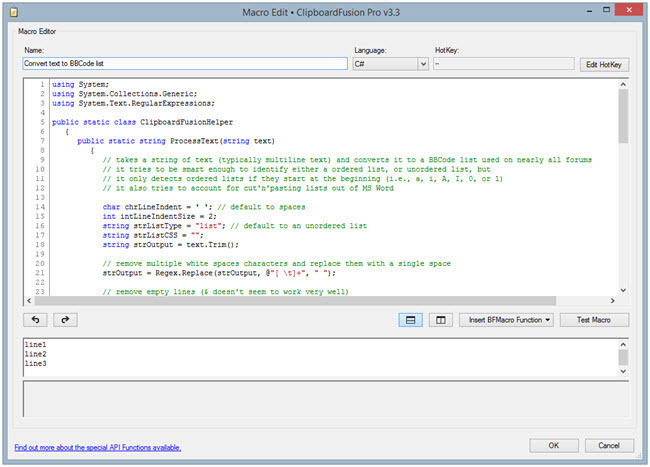 Scriptable Game Macros: Use our simple editor to create basic sequences, or code your own complex scripted macros using the built-in C#/VB.net code editor - the only limit is your imagination! Full VR Compatibility: Fully compatible with your favourite VR headsets, including the Oculus Rift. Take your VR gaming to the next level of immersion! VoiceBot is completely free to try, and the feature-limited free version is free to use forever. Give it a try today! We'd like to send out a big thanks to everyone who helped with the VoiceBot translations, and the many people that helped with the Beta versions. Thanks everyone! Navigate to https://console.developers.google.com/projectselector/home/dashboard in your web browser. After logging in with your Google Account, click the "Create" button and you'll be taken to the "Create Project" page. Give the project a name, then click the Create button. Click the "Go to APIs overview" link. Click the "Enable API" link. Scroll down to the bottom of the list of APIs and click the "Custom Search API" link in the "Other popular APIs" section. Click the "Create Credentials" button. Click the "API key" link. Give the key a name and then click the "Create" button. Copy the displayed API key and paste it into the Google wallpaper settings in DisplayFusion. Congratulations to our top contributing members for April 2015! They have been hard at work submitting, rating, and discussing images on WallpaperFusion, and have racked up some impressive reputation scores along the way! HashTools 3.0.1 is now available for download! This version includes an improved update notification window, restores drag and drop functionality (was broken in 3.0), and some general performance and stability fixes. We encourage everyone to update to this new version today to take advantage of these improvements. HashTools is still completely free, so you can update at no charge! If you would like to see a complete list of all the changes, please visit the Change Log. In Windows 7, if you want to do a true multi-monitor remote desktop session, both the local and remote machine need to be running Windows 7 Enterprise or Ultimate. If you're using a different version, you can still span the remote desktop session across all of your monitors, but it will be treated as one large display. 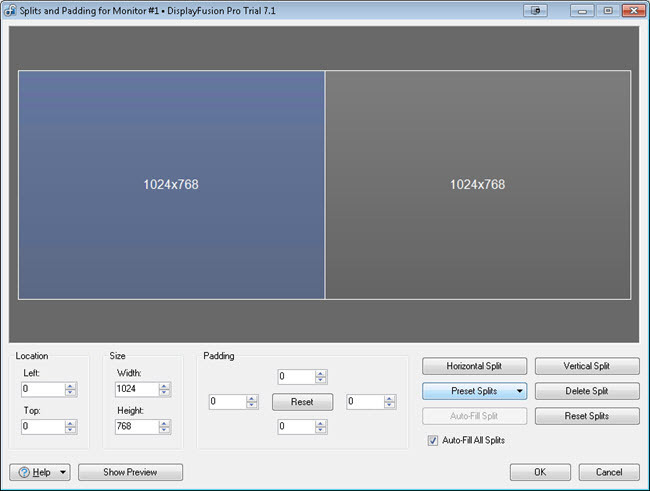 Using DisplayFusion, you can split that spanned session into smaller virtual monitors. The steps below assume that you have two monitors of equal screen resolution on your local machine (the machine you're connecting from). If you have more than two monitors of equal screen resolution, just make sure to setup the splits in step 5 appropriately (i.e. 3x1 for 3 monitors). 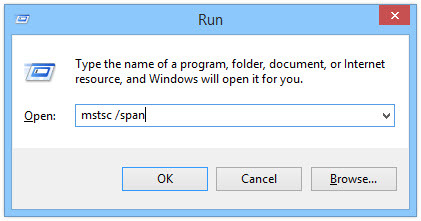 Open Start > Run (or press Win + R) and enter mstsc.exe /span. Note: The monitors connected to your local machine must all be the same resolution for this command to work. Enter the remote computer name and click Connect. 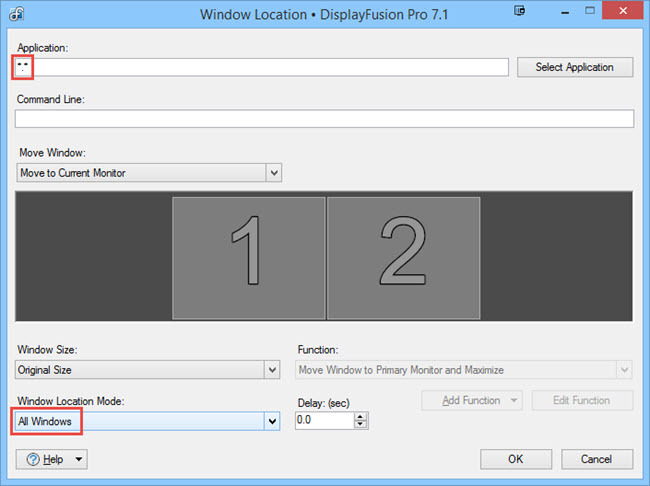 Open the DisplayFusion Monitor Configuration window, and click the Splits and Padding button. 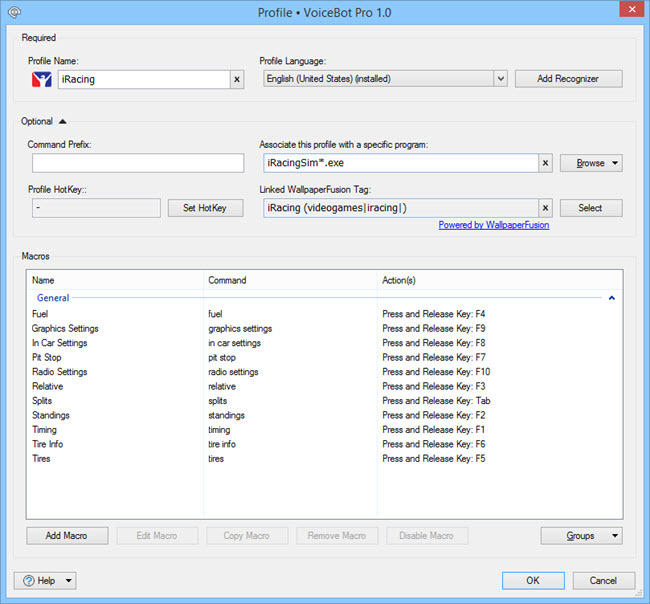 On the remote machine (in your RDP session), click the Preset Splits button and choose 2x1. Click OK to close the Splits and Padding window, and OK again to close the Monitor Configuration window. You should now have two virtual monitors inside your spanned remote desktop session. As always, if you have any questions or need to report an issue, please post them in the DisplayFusion Discussions, or contact us directly.